Midori Burke, nee Kameoka, was born in Japan and has lived her whole life in Tokyo, though now based in Kaohao (Lanikai), Hawaii. In 1987, Midori graduated from Malaspina College (now university) in British Columbia with a degree in business and financing. After graduation she worked for an American multinational corporation in Tokyo for 15 years. While enjoying the challenges of a business life, her heart often thought of the natural beauty she experienced in Canada and the healing properties of plants. She followed her heart and discovered healing through aromatic plants. Midori attended an intensive course in Aromatherapy taught by Michael Scholes in Hong Kong in 1997, and Michael’s Aromatherapy (300 hour) diploma course in 1997 in New York City. Midori successfully graduated and enrolled in additional aromatherapy specialty courses on Subtle Aromatherapy, Five Elements, Chakra Healing and Effective Blending Methods for Personal Blending. She has studied aromatherapy world-wide with internationally recognized teachers including Debbie Freund, R.N., Dr. Jane Buckle, Suzanne Catty, Rhiannon Lewis, R.N., Mark Webb, Robert Tisserand, Gabriel Mojay, Dr. Tim Miller, and Peter Holmes. Midori has also studied clinical Aromatherapy (internal blends) with leading French aromatherapy doctor Dr. Daniel Penoel. Midori has continued in her commitment to further her knowledge by attending aromatherapy conferences in the US, UK and Mexico. In addition to her expertise in aromatherapy, Midori is a Reiki Master, massage therapist, and a yoga teacher who has practiced Ashtanga Yoga since 2002. Midori has visited Mysore in India for extensive practice of Yoga, and professional training in New Zealand from John Scott in 2008/2009 (TTL1 & 2). Midori practiced massage therapy as an integral part of her healing practices, and studied lomilomi (Hawaiian) massage in Hawaii in 2014, qualifying for a Hawaii license. Midori integrates aromatherapy, yoga and vegetarian cooking with essential oils into her daily life, and for the past fifteen years she has been teaching, practicing and healing with aromatherapy with all her clients in Tokyo, Japan. Initially operating from a small shop, school, cafe and salon in Nihonbashi, in July 2010, Midori relocated to Minami Aoyama in an authentic 4th floor house that included a Yoga Studio, Aromatherapy Salon & School, Vegetarian and Natural Cafe & Lounge Bar and Shop. 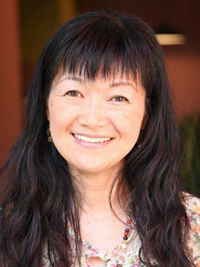 In 2018, Midori relocated to Kaohao (Lanikai), Hawaii, but she remains committed to a life filled with non-violence and has dedicated her life to healing the suffering of others through a combination of plant medicine, yoga practice, nutrition and therapeutic application of essential oils in a healing community environment.